Thirteen years ago, Isaac Camacho was a camper at the first Oregon 4-H international summer camp. At that time, Isaac says he wasn’t a good student and his teachers didn’t like him. Today, Isaac has finished his master’s degree in Curriculum and Instruction from Portland State University and he was recently accepted into Concordia University’s Transformational Leadership Educational Doctorate Program. The hard work and success is Isaac’s. The inspiration, motivation and support is Mario Magaña’s. 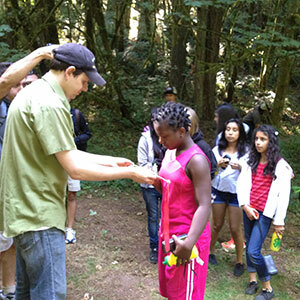 Mario, a CPHHS associate professor, created the summer camps – one for migrant middle schoolers and another for multicultural campers – as a place for a diverse group of Oregon middle school students to converge and gain insight into their personal and career aspirations. The five-day experience has provided thousands of campers with opportunities to learn about college and various professions, including natural resources, engineering, technology, forestry and the arts. 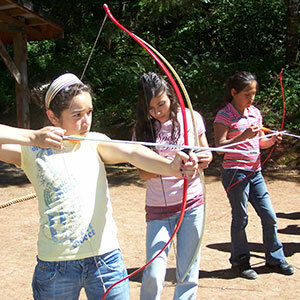 The curriculum leaves plenty of room for traditional camp activities such as archery, canoeing and swimming and also includes opportunities for campers to develop their leadership skills and participate in multicultural activities. Isaac has linked up that chain. He spent his first two years at camp as a camper, taking on a leadership role for the first time because his own counselor relied on him for help and he was becoming familiar with camp. He then spent the next four years helping younger campers as a counselor. The experience, he says, instilled confidence and lifelong relationship building skills. Another young person who made the camper-to-counselor transition is Luis Morales. Luis began attending 4-H international camps when he was in the fifth grade. During his first year, he was nervous and didn’t want to be there but his concern about not making friends quickly faded after he realized how much he enjoyed the experience. He attended three times as a camper and has served as a counselor for the past five years. He’s come a long way since being the shy kid at camp. Luis will be attending University of Oregon this fall and is working toward a degree in Chemistry with a Business Administration minor. He credits his experiences at camp for the person he is today. Likewise, Isaac has been heavily influenced on a personal level from his experiences with the 4-H camps. He’s even testified at public hearings at the Oregon State Capitol in support of 4-H’s 2011-13 budget. Isaac and Luis are both recipients of the competitive Gates Millennium Scholarship, which rewards 2 percent of applicants with five years of financial assistance for college. Mario says that Isaac and Luis are two of 10 camp counselors who have received the scholarship in the past nine years. “Words cannot describe what this scholarship means to me,” Isaac says. “At 14, I told my mom that I knew how I was going to get to college. ‘I have a plan,’ I told her. My plan was to have someone else pay for it, and three years later that became reality when I received this award. I worked very hard and gave up a lot of things in high school to put myself among the top applicants. Isaac and Luis are not the only young adults who have turned their camp experiences into something larger. Two OSU students who were once campers are now working with Mario and using their personal experiences with the camps to assist with 4-H youth development programs. 4-H Youth Development Education Program Assistant Olivia Guillen was a camper while she was in the fourth grade and became a camp counselor while she was in high school. She is now 18 and will begin classes at Oregon State. Although she wasn’t a camper, Isamar Chavez began volunteering as a counselor with 4-H in 2014. Now she’s an intern with Mario, and will begin her second year at OSU this fall. Isamar didn’t know about the 4-H program while she was younger, but learned about it through another volunteer while she was attending community college. She decided to volunteer and continued going back because she liked being part of the environment.